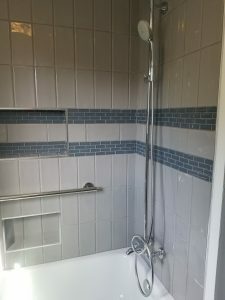 Shower Tip: Add a Grab Bar! 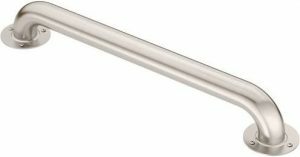 LET’S TALK BATHROOM SAFETY: SHOWER GRAB BARS! Perhaps you’ve stayed in an ADA compliant hotel room and have seen grab bars in showers or near tubs. Maybe you understand how these would benefit others for their needs. Or maybe you’ve enjoyed the convenience of them for your own use at that time. But have you considered adding one to your own personal bathroom? It used to be that there were very few designs of grab bars on the market. Most had the same clinical look. Many homeowners and designers associated grab bars with this look. So, unless they were required, the aesthetics of the shower took priority over the added safety benefit. Manufacturers heard this complaint. Now, they are available in varying sizes, finishes, and even appearance, while still maintaining ADA compliance. In almost every bathroom project I’ve worked on, my clients agreed with adding a grab bar into the design. And if a client didn’t, I would still ask the contractor to put blocking in the wall so a grab bar could be easily added at a later point. Something that every client agreed was a good idea! Here’s one bath/shower I just completed where the client agreed a grab bar was a smart addition. 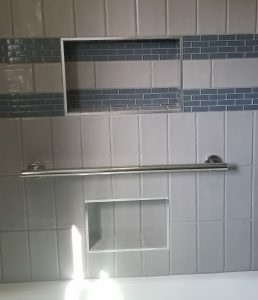 This grab bar we had installed matches the shower and bathroom design perfectly. It doesn’t take away from the design at all! 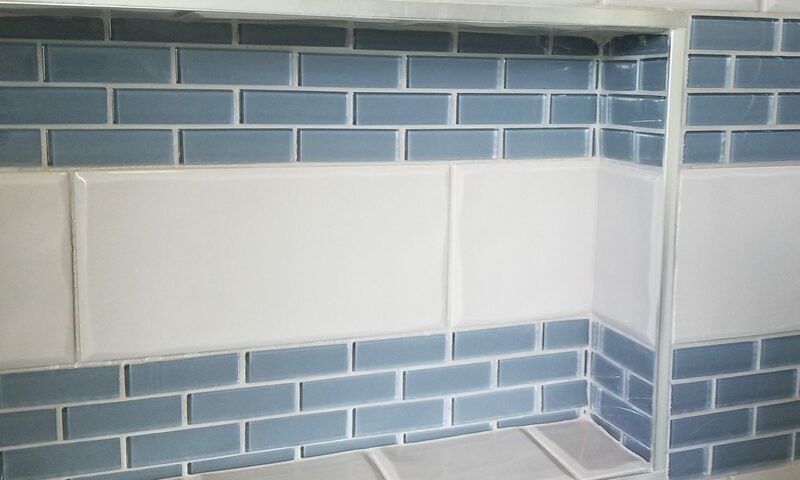 In fact, it brings the rest of the fixtures all together and adds another element to this wall, separating the two niches beautifully.